This santa ornament is hand made and hand painted making for a “unique” personal gift for you or a loved one. 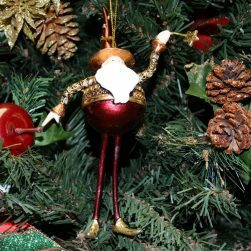 This delightful gold wizard Christmas ornament holding his star topped wand is ready to bring magical Christmas cheer to your home. 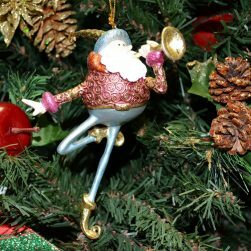 This delightful santa Christmas ornament is playing his trumpet and announcing to the world that he is ready to bring magical Christmas cheer to your home. 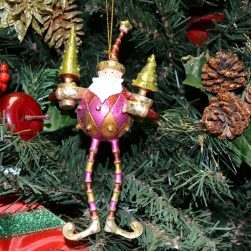 This hand made and hand painted holiday ornament has vibrant colors, intricate details and is welcoming the Christmas season. Our delightful Santa is ready to deliver presents to all the little boys and girls. 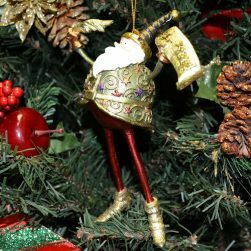 This hand crafted Santa Christmas tree ornament is enjoying the Christmas preparations. 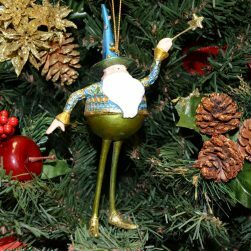 This delightful turquoise wizard christmas ornament holding his star topped wand is ready to bring magical Christmas cheer to your home.